As I mentioned on Facebook my copy of THE POETRY OF US arrived and I’m enjoying it immensely. It’s on my desk and from time to time I treat myself to reading another few poems. I’m up to “Science in North Dakota,” by Bill Holm. It’s tempting to sit down and devour these delicious efforts all at once but I don’t think that does justice to the poets who worked so hard to perfect their offerings. Better, I think, to read slowly, sometimes aloud, to savor the flavor of all these diverse voices. One nice thing about reading 200+ poems is that I’m discovering many gifted poets I don’t know. Many of their poems leave me shaking my head in appreciation of the skill, sensitivity, and insight of the poet. It’s a wonderful reminder that there are many fine poets whose voices are not heard often enough and are well worth the search to read more of their writing. When I finish reading this book, I’m going to make a list of poets I want to know better and set out to find them. The skill of the anthologist is evident in the selection of work represented to give a true taste of how we think and speak and sound across this great land. Bravo to J. Patrick Lewis for bringing together this important collection. As I said on my Facebook post, if there is anyone left who does not believe that children’s poetry deserves respect for its power to reach hearts and souls, then by all means buy them this book. I haven’t received a copy yet of THE POETRY OF US but maybe it will still show up before much longer. Online it looks like another handsome effort by our friend J. Patrick Lewis and I’m pleased to have two poems in the collection. Today I thought I would share one of them with you in case you haven’t received or purchased your own copy yet. The poem is protected by copyright so I think it’s safe to post it here. For telling them the tales of Tom and Huck. He said his words were truthful in the main. But none would say they ever lacked for pluck. 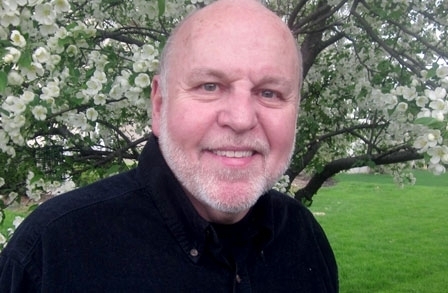 Missouri kids give thanks for Mr. Twain. For Tom to sit in classes was a strain. Aunt Polly heard excuses with a cluck. She hoped his words were truthful in the main. But Huck was quick and knew the time to duck. From trouble but they always got unstuck. They swore their words were truthful in the main. The Twain Award with writing skill and luck. Each offers thanks for Mr. Twain. Their words they say are truthful in the main. By request, let’s talk about revising poems. I have no absolute formula but in general the process from beginning idea to finished poem goes something like this. The idea is the easy part. It may come from a prompt such as the word of the month challenge. It may come from a thousand places: thoughts, conversations, quotations, pictures, jokes, cartoons, joyful moments, embarrassments, sadness. Reach your hand into the air and grab one. Ideas are everywhere. Getting started is just as generous with pathways. Maybe I’m responding to a challenge to write a limerick or a haiku. Maybe the challenge is to write about a particular subject. Now and then I simply make a list of subjects of interest, choose one from the list, and set out to capture the essence of it in a poem. Be patient and don’t set the hook too soon. I’m sure that everyone has his/her own method for getting into the poem itself. My typical beginning is rather willy-nilly. I try any number of first statements, probing to see if this is coming down as free verse or in something with rhyme and meter. There are times when it takes several stabs at it before an answer seems to appear. Once a pattern, or lack of one, seems dominant, I slavishly follow that lead to see if what I’ve chosen is do-able. In a sense, I revise as I go but only enough to allow the rough poem to expose itself with its faults and possibilities. Unless the poem has a strictly dictated form, I have to determine as I go how many stanzas I need to tell my story. Too few kills the tension. Too many bores the reader. Finally comes the last two steps. The first is revision. I come to this with a heavy hand. Stanzas meet their maker. Lines trade places. New information is introduced. Sometimes the first “final” version is hard to recognize from the last one. The second last step is rewriting. This means, to me, polishing. Looking for better metaphors, stronger verbs, more exciting nouns, more surprising rhymes. Now and then a poem just plops itself down with a smug, “Aha!” When that happens, I look around hoping no one saw how easy it was. Mostly, I work at it. My record number of revisions/rewritings was something over twenty. My average is probably half a dozen. robins band together leave for warmer places. hundreds, maybe thousands of mile. Here is the last draft of those same two stanzas. Time is another partner in this pursuit of a fitting end. My writer’s need to finish sometimes gets me in trouble. A year or two ago I wrote something for one of Pat Lewis’ anthologies. He read it and pronounced it pap, or something akin to it. He was, of course, correct. I think Jane Yolen still belongs to a writer’s group. Is that right, Jane? Getting writing right is not easy but for me that is the joy of writing. The floor is open for conversation. Thanks in advance. J. Patrick Lewis’s latest anthology is out. 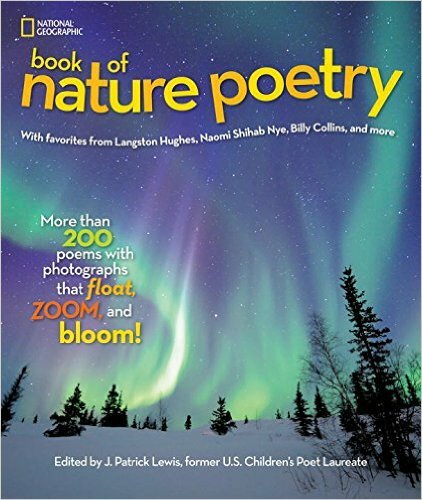 It’s called NATIONAL GEOGRAPHIC BOOK OF NATURE POETRY: MORE THEN 200 POEMS WITH PHOTOGRAPHS THAT FLOAT, ZOOM, AND BLOOM! Publishers Weekly says, “Few books make it clearer why nature inspires so many poets to reach for the pen.” It’s a highly entertaining and inspirational book and I recommend it. The poets who are in it have been sending high-fives to one another. It’s that kind of book. My contribution reflects on the act of union between a stalagmite and stalactite that touch at last and join as one after eons of reaching toward one another in the dark. You’ll find many of your favorite poets in this collection as well as several talented names you need to know better. Thanks, Pat!